So here is another example of why citizens of Portsmouth should be concerned that their government is acting ethically, morally and follows the law. If City Management and City Police Officers lie in public and to the public they can not be looking out for the citizens they serve nor can they be trusted to “do the right thing”. Did Mr. Chandler apply for the job in Texas? 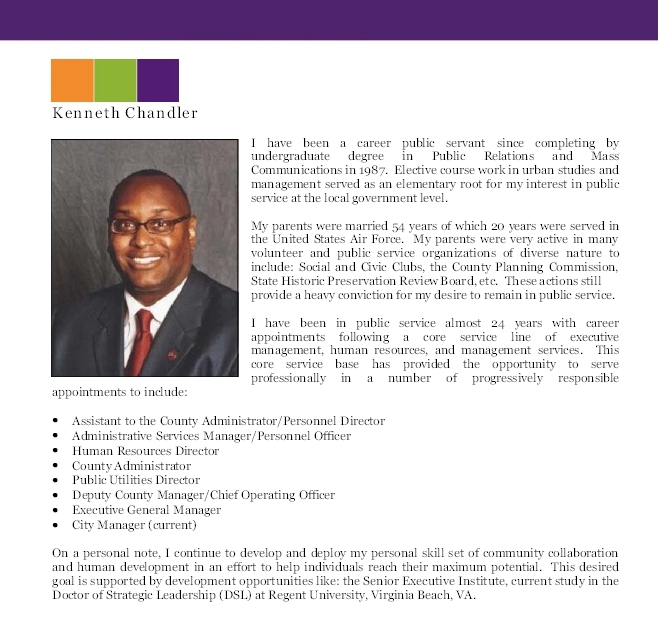 If you look at the documents that were released by the City of Plano you will see that Mr. Chandler’s resume speaks in first person. Which has also been previously pointed out in the media. Click here to see the January 29th, 2011 Virginia Pilot Online Article. Chandler speaks in First Person in his resume. The second clue is that his resume is up to date, you will note it lists his current position as “City Manager (current)”. 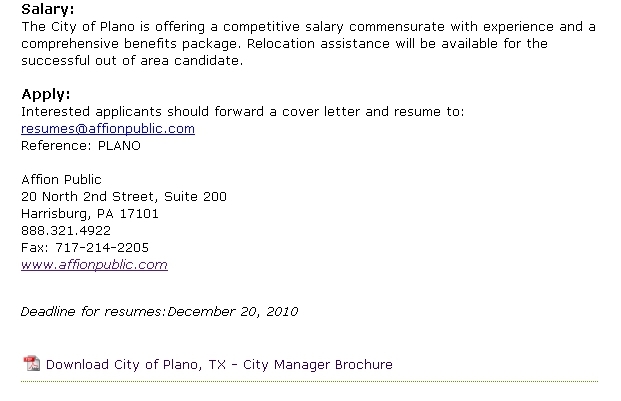 First Page of Chandler's Plano Resume Note the "City Manager (current)"
So the big question is how did Mr. Chandler’s resume get emailed to Affion? Portsmouth deserves better from it’s Public Servants. Honesty and doing the right thing appear to mean nothing to people in the management of the City of Portsmouth and the Portsmouth Police Department. 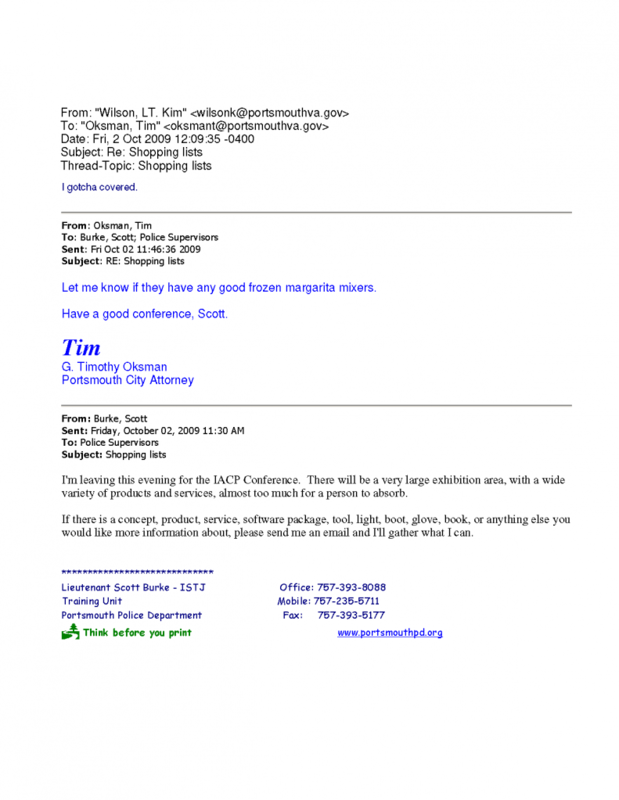 They are more interested in looking out for themselves or finding Margareta mixers at Police Conferences as the Portsmouth City Attorney Mr. Tim Oksman did when a Police Lieutenant ask via email if anyone needed anything from a Police Conference. Perhaps people find these incidents amusing but they have no place involving the management of the City of Portsmouth or the Portsmouth Police Department. At the least they are inappropriate but it reflects poorly on the City of Portsmouth. Portsmouth City Attorney Tim Oksman asking about margarita mixers. This entry was posted in City of Portsmouth Virginia, Lack of Honesty, Lack of integrity, Portsmouth, Portsmouth City Attorney Tim Oksman, Portsmouth City Manager Kenneth Chandler and tagged City of Portsmouth Virginia, Lack of Honesty, lack of integrity, Portsmouth City Attorney Tim Oksman, Portsmouth City Manager Kenneth Chandler. Bookmark the permalink. Portsmouth Police Department an Arms Supplier to criminals? This blog is the individual effort and product of James Conrad and is not to be construed to represent the City of Portsmouth or the Portsmouth Police Department in any way.